Nikujaga quite literally translates to “meat and potatoes” - niku means "meat" and jaga means "potatoes" in Japanese. It's a comfort food and the Japanese version of beef stew. 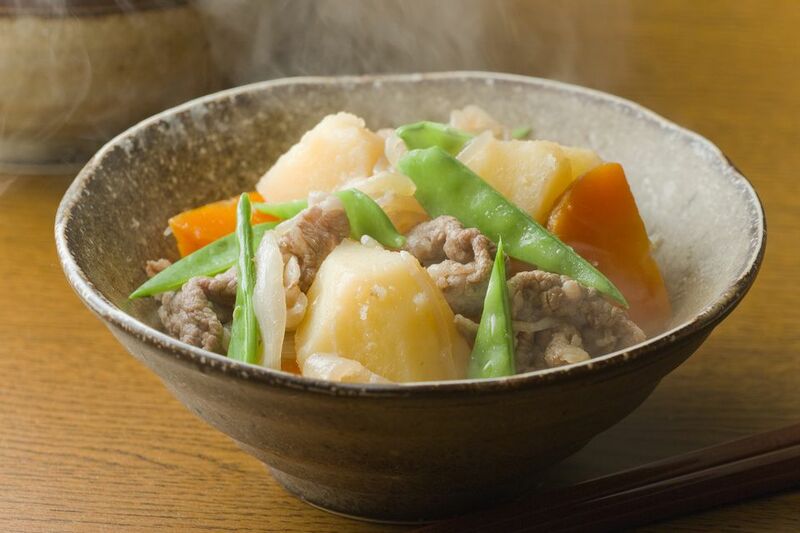 The beef in Nikujaga is added more for flavor than substance. This is a real workhorse of the Japanese home kitchen. It's high in energy, low on prep time, and very tasty. The beef you use can be anything from ground chuck to short ribs; just make sure you use a cut with enough fat. Otherwise, the meat will get dried out. As the name implies, you need to add potatoes, but you can also add carrots and onions for color and flavor. Beyond that, you can add pretty much whatever you want. Potatoes used in Nikujaga are anything you like. If you like soft and fluffy, use Russet potatoes. If you like smooth and creamy, use Yukon. Russet potatoes, because they are soft, tend to dissolve in the broth, but that makes this dish taste good, too. Nikujaga is cooked in dashi because it adds umami (a savory taste), but low-sodium beef stock or even water would work fine. Dashi is an incredibly simple broth, and it forms one of the culinary cornerstones of Japanese cooking. It's made in about 10 minutes with just 3 ingredients: water, kombu (dried kelp), and bonito fish flakes. The resulting clear broth tastes like the essence of the sea. Nikujaga is traditionally seasoned with soy sauce, sugar, and mirin which gives it a savory sweet taste, but you could have some fun here and season it with ginger, garlic, tomatoes, and herbs. Like any stew, this is one of those dishes that tastes even better the next day, so make a big batch and enjoy the leftovers for a few days. Heat 1 tablespoon of vegetable oil in a deep pot and sauté the meat on high heat until it changes color. Add onion, carrot, potato, and shirataki in the pot and sauté together. Pour dashi soup and bring to a boil. Turn down the heat to medium and skim off any foam or impurities that rise to the surface. Add sugar, mirin, and soy sauce and put a drop-lid.